BRUSSELS, Aug 1, 2014 (PPI Magazine) - As the world's foremost producer of Specialised Cellulose (dissolving pulp), it should come as no surprise that Sappi decided to convert its kraft pulp mill at Cloquet, MN, to produce dissolving pulp. Announced in November 2011, the $170-million Athena project kicked off in June 2012 and the mill has been making Specialised Cellulose since early June 2013. Mike Schultz, managing director at Cloquet, says the company was looking ahead when it made its decision. "As we looked across our pulp and paper businesses, we saw the greatest opportunity for future growth and returns by growing Sappi's position as the world's largest producer of dissolving pulp (1.3 million tonnes/yr). From a capital and economy-of-scale perspective, Cloquet's pulp mill was ideally suited for the conversion to dissolving pulp. We are well positioned in the business with our low-cost production capabilities." Prior to the conversion, Cloquet was an integrated mill as the kraft pulp mill fed two paper machines, PM 4 and PM 12, producing about 350,000 tonnes/yr of coated wood-free grades, and provided significant pulp production for external sales. (see sidebar.) Pulp capacity has dropped from 500,000 tonnes/yr to 330,000 tonnes, a reflection of the higher purity requirements of dissolving pulp. The pulp mill uses a 100% hardwood furnish, a mix of aspen and maple. The Cloquet mill is triple certified in accordance with the leading sustainable forestry chain of custody certification bodies: FSC, SFI and PEFC and the mill is proud to be associated with these organizations and their efforts to drive sustainable business practices. The mill draws wood from Wisconsin and Michigan as well as Minnesota. 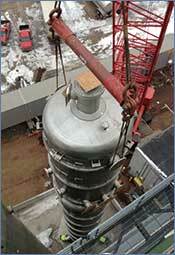 In 1996, Cloquet installed the first Sunds Defibrator (now Valmet) SuperBatch pulping system. A second phase was installed in 1999. The washing process is press based. The SuperBatch system paved the way for Cloquet's conversion. The mill had a lower cost because of its starting base with SuperBatch. Therefore, Cloquet was already one of the most modern pulp mills in North America before its conversion. Other factors working in its favor were a world-class environmental performance, a good workforce and excess utilities capacity - steam, electrical, water and effluent. Sappi fast tracked this project and Schultz says it was treated as 11 separate projects under one umbrella. "Every aspect of the mill was touched." Beyond the work on the paper machines, there were main design objectives. Schultz explains, "First, we designed the equipment and construction to meet the permit limits of our recovery boiler in order to fast track the project." "Second, we had a strong focus on ensuring that our product quality would be consistent and compatible with other Sappi dissolving pulp mills in South Africa, Saiccor and Ngodwana." Then, equipment was designed to achieve production costs in the lowest quartile ensuring a higher return on the investment. Finally, Schultz adds, "We wanted to have the flexibility to produce either Specialised Cellulose or NBHK depending on market conditions." The drum de-barker was replaced with an Acrowood rotary de-barker. Liebherr supplied a new woodroom infeed crane. "Because our existing digesters are modern displacement batch digesters, our focus was to make necessary piping and tank farm changes to accommodate the pre-hydrolysis step," Schultz explains. "We also added two additional digesters (10 in all) to allow production at a pace to match the recovery boiler permit limit. This was the largest and most complex project within the overall conversion." The digesters were built on site and the eight original units were changed so that all match exactly, e.g., same nozzle arrangement. Cloquet worked with Lenzing Technik and converted to its Continuous Batch Cooking (CBC) process from the SuperBatch process. Lenzing calls this process VISCBC. The VIS stands for viscose which, Schultz says, "is essentially the addition of a pre-hydrolysis step to the CBC process." The CBC process has cooking liquor circulate between the digester and the tank farm providing for a more uniform cook. CBC is Lenzing's licensed technology. As well as being a producer in its own right, the Austrian producer has an engineering arm, Lenzing Technik, with whom Sappi worked. Following the fiber path, in addition to an existing two-stage oxygen delignification, Cloquet added an ozone generator and ozone bleaching stage in front of the W-D-Eop-D bleach plant. Wedeco supplied the ozone generation equipment while Andritz provided the ozone bleaching stage. The "W" is a pre-wash stage to bring the pulp up to its needed consistency. Ahead of the pulp dryer, the mill added a Noss six-stage cleaning system to replace the screening system. Schultz adds, "We also made certain modifications to the pulp dryer and bale line to increase capacity and to accommodate the different characteristics of the dissolving pulp as well as packaging requirements." GE supplied a "very large" demineralized water system (3,000 gal/min). Schultz explains that this was a necessity in order to achieve the required quality characteristics. To maximize capacity of the recovery boiler, more surface area was added to the evaporator train and modifications were made to some of the evaporator bodies to improve throughput. "We also added quaternary air and made liquor firing modifications to increase production through the recovery boiler," Schultz says. "On the recaust side, we added an additional green liquor cassette (three in total) and an additional disc in our white liquor pressure disk filter (10 in all)." This work was done by Valmet (then Metso). On the control side, Cloquet converted to a Honeywell distributed control system (DCS) across its fiber processing areas while remaining with its Fisher system for liquor processing. As mentioned, Sappi's Saiccor mill has been used as a benchmark. As Schultz says, "Given that one of our primary objectives was to be compatible to the attributes of our Saiccor mill, we relied heavily on the experience and the technical expertise that we have developed over the years in South Africa. Through our quality and sales objectives, we have truly made this a global business for Sappi." Although Saiccor was used as a model for quality, Cloquet did not need to send any of its personnel there for training. Schultz explains, "Saiccor is a sulfite-based operation while Cloquet is pre-hydrolysis kraft-based (PHK, the pre-hydrolysis step removes hemicellulose). We utilized Sappi's Technology Center and Specialised Cellulose Center of Excellence, as well as Lenzing Technik to help make the translation between the two processes and deliver the quality objectives. "Also, at the same time we were making the conversion at Cloquet, we were also converting our Ngodwana (South Africa) mill: 210,000 tonnes/yr Specialised Cellulose. As a result, resources were involved in each of the mills' capital projects." Nonetheless, training was extensive, but given that most of the project was modifications/additions to well-understood processes, and given that the mill had an operation that needed to keep running right until the final conversion steps, traditional classroom training was minimized. "We involved the operators in all project HAZOP reviews, DCS development work including simulator times and some classroom training," Schultz adds. "The best preparation was the hands-on problem solving that took place on a day-to-day basis to ensure the project was executed successfully." The mill has three power boilers, two of which are fired with wood waste while the other uses natural gas. It also has three turbine generators that can produce 89 MW of power and three hydro-generators by the adjacent St. Louis River that can produce an additional 6.54 MW. The mill only generates what it needs and does not sell any surplus electricity. Its effluent treatment system includes two primary clarifiers; effluent undergoes primary treatment in Cloquet then discharges to a publicly owned treatment works (WLSSD - Western Lake Superior Sanitary District). The mill is in the Lake Superior watershed from which it draws most of its influent water, but can also draw from the St. Louis River as back-up. In the late 1980s there was a large campaign to protect the Great Lakes from increasing pollution levels resulting in the construction of the WLSSD. The government wanted a large, state-of-the-art treatment plant but to make it viable, it had to draw from a large area to have enough effluent. The mill is now the largest single source of the WLSSD. The treatment facility is in Duluth, MN, about 35 km east. Schultz believes the mill has one of the lowest published greenhouse gas (GHG) emissions figures of any of its competitors globally. In 2013, it emitted about 0.35 tonnes of carbon dioxide per tonne of product produced (including emissions associated with purchased power). About 95% of its steam is generated from renewable sources. And, Schultz notes, that 95% is across the mill's entire energy picture. Cloquet did a Pinch study after the conversion to dissolving pulp to bring the level back up to 95%. All of the electricity the mill generates is Green-e certified. Cloquet has also done extensive work to increase the life of its landfill. At one point in 2004, it was down to seven years. Through the mill's efforts, landfill life expectancy is back up to 32 years. The job at hand now is bringing the mill to capacity with a consistent quality. Sappi's extensive expertise and planning have helped speed that goal along. "We essentially started up on NBHK in early May 2013 after taking four weeks down to make the final conversion steps," Schultz explains. "We then started producing Specialised Cellulose at the beginning of June. We hit first quality right from Day One and we have far exceeded all of our quality objectives and quickly reached 90% of our production goals. Heading into 2014, we were able to close that last 10% gap and are exceeding our availability objectives." The ability to still produce NBHK is an important consideration as Schultz has noted. The mill did have a 10-day campaign of NBHK in January. "We had room in our schedule and we wanted to prove our capability to swing to NBHK and back. Our ability to make that swing also exceeded our expectations." Paper grade pulp capacity is still 500,000 tonnes/yr. The flexibility built into the conversion project also allows a further conversion to produce acetate-grade pulp in the future. Another possibility for the mill is the active bio-sector. The mill's pre-hydrolysis stream is very sugar-rich so rather than burning it, there is potential for value-added products. Current production is supplying the rayon (clothing) and non-wovens (wipes) markets. Most production is transported to a North American port shipping to overseas markets. Cellulose fiber accounts for just 4% of the global textile fiber market so there is room to grow. Polyester has 48% of the market and cotton has 33%. But, for the latter, Schultz says it is basically at capacity because of the demand for food crops from arable land. In February 2013 the Chinese Ministry of Commerce (MOFCOM) announced it would conduct an anti-dumping investigation of dissolving pulp from the U.S., Canada and Brazil imported into China during 2012. In April, MOFCOM released its final duty determination and imposed final antidumping duties on dissolving pulp exported to China from the U.S., Canada, Brazil. Sappi does not anticipate that the duties announced will impact its business or ability to service its customers due to the nature of its current sales plans. It is also important to note that while all of the major producers of dissolving pulp in Brazil, Canada and the U.S. were initially named in the request for an anti-dumping investigation, Sappi was not named because the Cloquet pulp mill did not produce dissolving pulp during the period of investigation.